Chief town of the department of Puy-de-Dôme, France. The origin of the Jewish community of Augusta-Nemetum (Clermont) is usually assigned to the third century of the common era. It is said that the first apostle of Auvergne, St. Austremoine (Stremonius), was killed about 286, by order of Lucius, the Jewish governor of Issoire, by a Jew, the owner of the village Perrier (compare Labbe, "Nova Bibliotheca," ii. 482; Gonod, "Chronologie des Evêques de Clermont"; A. Tardieu, "Histoire de Clermont"). This is evidently a legend, as perhaps is also the story told by the Abbé Marmeisse ("Vie de St. Verny et de Ste. Marcelle," Clermont, 1858), that, about the second half of the thirteenth century, a Jewish working man murdered a young Christian child named Verny, who was afterward proclaimed a saint. It is certain, however, that the Jews established themselves in Clermont at a very early period. They then occupied the entire eastern part of the market-town Fontgiève, called "Fontjuifs" or "Fontjuifve" in the fourteenth century; and they owned the hillock Montjuzet; i.e., "Mons Judæus" or "Judaicus" (Cohendy, "Inventaire des Chartes des Archives, Département du Puy-de-Dôme," pp. 11, 51). Sidonius Apollinarius, Bishop of Clermont (472-488), held the Jews in great esteem. He speaks in the highest terms of the Jew Gozolas, servant of the Bishop of Narbonne ("Epistle," vi. 4), and recommends to the bishop Eleutherus the cause of a Jew. In a third letter, addressed to the bishop Nonnechius, Sidonius Apollinarius recommends to him Promotus, a Jew of Clermont (l.c. ii. 13). Bishop Gallus, uncle of Gregory of Tours, also showed good-will to the Jews. When he died (551) the Jews of Clermont took part in the general mourning, weeping for the man who had treated them so kindly, and carryingthe wax tapers at his funeral (Gregory of Tours, "Vitæ Patrum," vi. 7). Bishop Cautinus (551-571) esteemed them no less. "He was dear to the Jews," says Gregory of Tours (l.c. iv. ), "and was much attached to them." 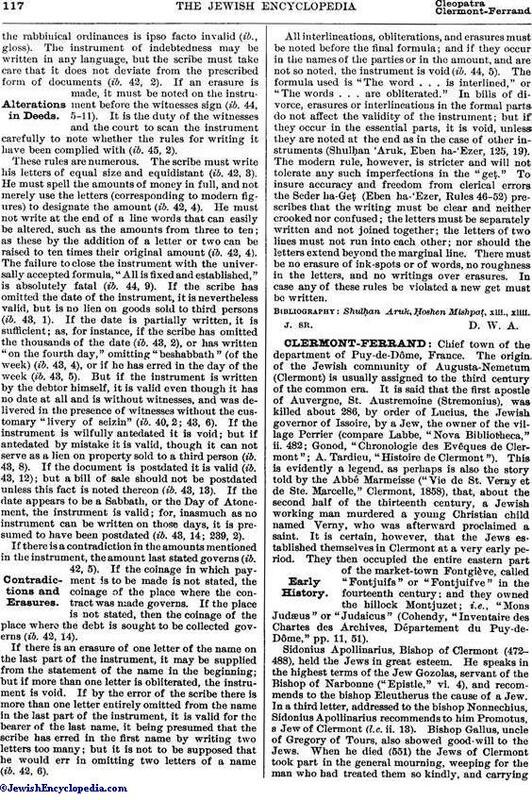 The historians of Auvergne, Savaron in his "Origines de Clairmont," and Audigier in his "Histoire de Clermont," censure this prelate for his familiarity with the Jews, saying that "he lived on friendly terms with them, not with the view of enlightening them, but in order to buy his furniture and jewels cheap from them." On his death the presbyter Euphrasius sent to the king many valuable things which Cautinus had bought from the Jews—a proceeding quite different from those of Bishop Avitus a few years later (see Avitus of Auvergne). The councils which met at Clermont in the sixth century occupied themselves repeatedly with the affairs of the Jews. Those of 535 and 549 forbade intermarriages between Jews and Christians, and the appointment of Jews as magistrates of the people (Conc. Arverne, Canons vi. and ix.). It does not appear that Jews were living at Clermont at the time of the first Crusade (1096). Only toward the end of the thirteenth century are traces of a Jewish community again found in that city. At that time (1298-99) the Jews of Auvergne paid into the royal treasury a tax of 992 livres, 6 sous, 6 deniers (Library of Clermont, Auvergne MS. No. 62; compare "Revue Etudes Juives," xv. 248). In 1293 Jews dwelt in several market-towns or villages of Auvergne, such as Herment, Ennezat, Montaigut, Lignat, etc. (see article by M. A. Tardieu, in "La Dépêche du Puy-de-Dôme," Sept. 14, 1891). At Orbeil lived one of the disciples of R. Ḥayyim of Blois, R. Isaac, author of "Menahel" (The Guide), a collection of ritual rules known only by the quotations from it found in the ritualistic work "Orḥot Ḥayyim" of Aaron of Lunel (Renan-Neubauer, "Les Rabbins Français," p. 448). The Manuscript de Rossi 313, 3, cited by Gross ("Gallia Judaica," p. 589), contains the haggadic explanations of Nathan ben Joseph. This scholar probably came from Clermont. 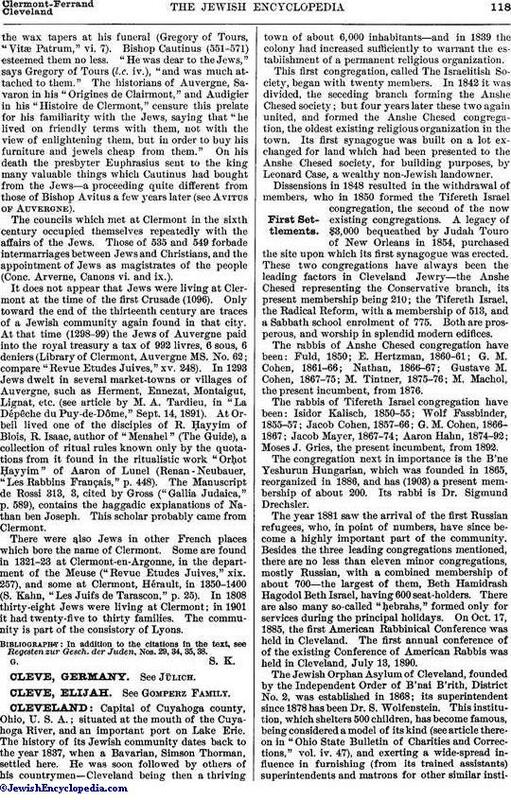 There were also Jews in other French places which bore the name of Clermont. Some are found in 1321-23 at Clermont-en-Argonne, in the department of the Meuse ("Revue Etudes Juives," xix. 257), and some at Clermont, Hérault, in 1350-1400 (S. Kahn, "Les Juifs de Tarascon," p. 25). In 1808 thirty-eight Jews were living at Clermont; in 1901 it had twenty-five to thirty families. The community is part of the consistory of Lyons. In addition to the citations in the text, see Regesten zur Gesch. der Juden, Nos. 29, 34, 35, 38.